ApartmentCommissionTracking.com from Spherexx.com is a software that computes, assigns and audits rewards for attaining performance goals for staff members of multi-housing real estate employees. The program is versatile and adaptable to a variety of award systems; such as individual or grouped occupancy based, operations based, leasing; lease renewal, or point achievement goals. Some bonus structures are based on multiple achievements across multiple job responsibilities. Apartment Commission Tracking will layer and disseminate advanced bonus and commission structures. Rewarding goal achievements can be very tedious, especially when the financial award is based on individual performance, like a commission paid for a rental lease or renewal. With ApartmentCommissionTracking, the supervisor can set parameters within the program that will eliminate errors, as an example: paying for a lease twice at different pay periods, or paying for a lease or renewal that does not come to fruition, or a lease that is claimed by multiple employees. It is very time-consuming to unravel such a chain of events. This program requires accountability on behalf of the awardees and thereby keeps review and personnel intervention at a minimum. Likewise, the program requires leaders to establish guidelines in published form. ApartmentCommissionTracking provides a very advanced mobile companion version because Spherexx understands that many multi-site real estate managers are constantly in motion and often travel frequently. With Apartment Commission Tracking, supervisors can view staff member’s personal and group performance at a glance, set new goals, and approve payments from any location. 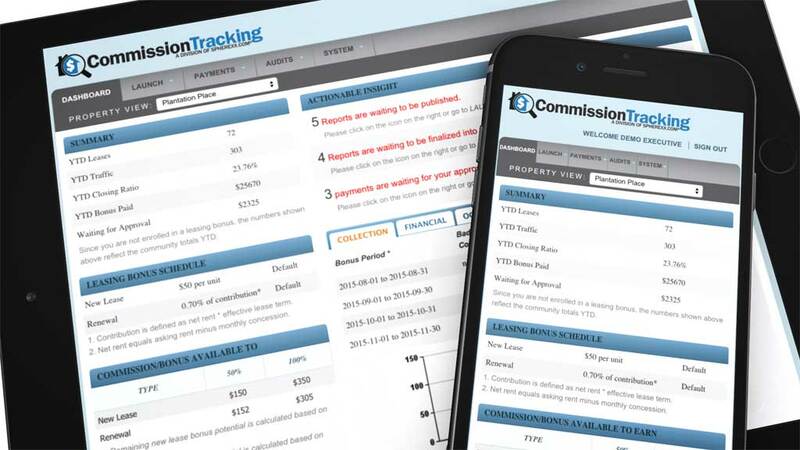 Schedule a personal DEMO at 866.491.7500 or email INFO@APARTMENTCOMMISSIONTRACKING.COM. We are the national iPad provider for Lincoln Property Company, Pinnacle, ZRS, and many more.